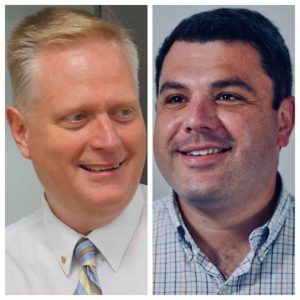 On Friday morning, state Rep. Fred Keller (R-Snyder) and Democrat Marc Friedenberg, professor at Penn State University, faced off in Lewisburg for a meet the candidates forum. The event, hosted by the Greater Susquehanna Valley Chamber of Commerce, included the candidates vying for the 12th Congressional District’s positions on a number of issues, sparking disagreement on specific policy proposals. The candidates see different roles for government. Keller believed it’s in the best interest to have a smaller government to benefit the people. He specifically drove home this point while talking about his opposition to the Green New Deal. Friedenberg didn’t agree with his GOP opponent’s notion that the government is seeking to control everyday life with policy proposals like the Green New Deal and believes Keller is also mischaracterizing his position on that specific proposal. The Democrat stressed his belief that renewable energy will benefit the district and mentioned a story that included his father, who he said is a “climate science denier”, putting 40 solar panels on the roof of his house and saw the economic value in it. The topic of President Donald Trump’s trade tariffs prompted different responses as well. Keller said Trump’s approach with trade tariffs “may be unconventional but we have to give him some latitude,” the Williamsport Sun-Gazette reports. Friedenberg advocates for playing fair with other countries, while some countries such as China don’t always adhere to the laws he thinks. “We need to look at industry leaders before imposing tariffs,” Friedenberg said according to the Williamsport Sun-Gazette. Both candidates also addressed what Congress can do to help solve the most pressing problems. Keller harped on the gridlock in Congress and pointed to the recent investigations relating to Trump. The GOP candidate believes the Democrats only want more investigations, while the American people want their problems addressed. “My opponent says more investigations,” Keller said according to the Williamsport Sun-Gazette. Friedenberg said that the arguments in Congress are too often combative and believes Social Security benefits, jobs, and ability to send their kids to college are the most pressing issues. Perhaps a rare instance of some common ground was found on the topic of infrastructure. Both Friedenber and Keller agreed that investing in infrastructure would help move the economy forward. The candidates are slated to meet face to face one more time before the special election. On May 2 at 8:00 pm the candidates will participate in a debate hosted by WVIA-TV. I also participated in the a meet the candidates forum for this district with myself. I lost and will now supports Marc Freidenberger.